This gorgeous bodice is crafted in kitten soft wool in a deep midnight black highlighted by an asymetrical inset of sugared pink silk. 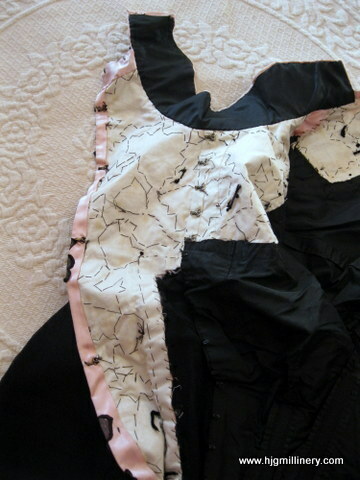 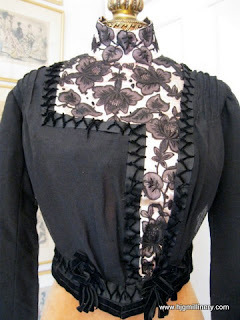 Hand sewn with feminine floral appliques on the pink silk and trimmed with silk chenille this fitted bodice is dynamite with tiered black lace at the cuff, a wrap around collar, hidden hook and eye closure at the left side, interior boning and hook and eyes running from throat to waist, no shatter or underarm issues present, minor wear to the silk fabric, chenille and appliques, new floss eyes (hook present, thread of the eye separated) needed at the rear neck for closure and comes to you as found. 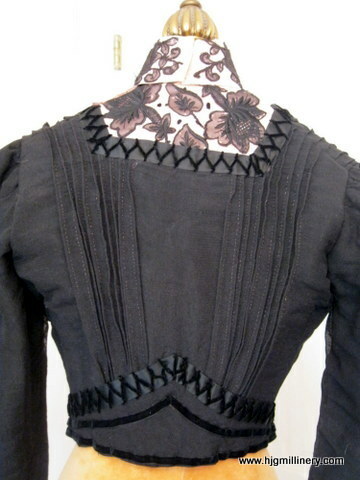 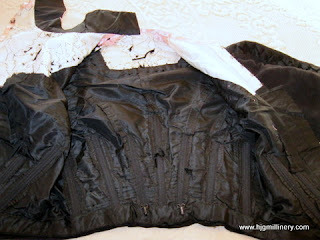 I believe this bodice dates to 1899 but please use your knowledge to determine the exact age of this fantastic garment, it has not been cleaned, comes to you as photographed and is, in my opinion, of sensational quality, style and design. 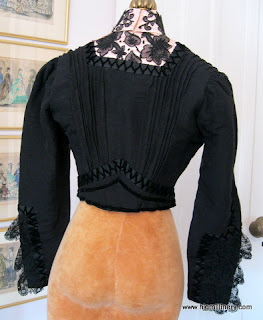 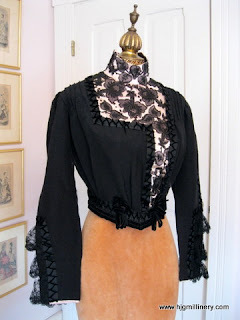 Collar: 13 1/2" Shoulder: 15 1/4" Bust: 36"
Waist: 25" Overall Length Front: 20" / Rear: 16" Sleeve: 23 1/2"
Based on the sleeves, I'm thinking more 1902 for this bodice. 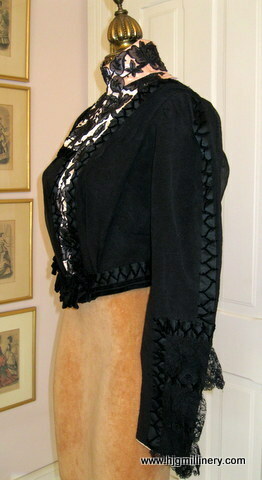 And the sleeves are the reason I'm posting it as well - look at the cuffs!